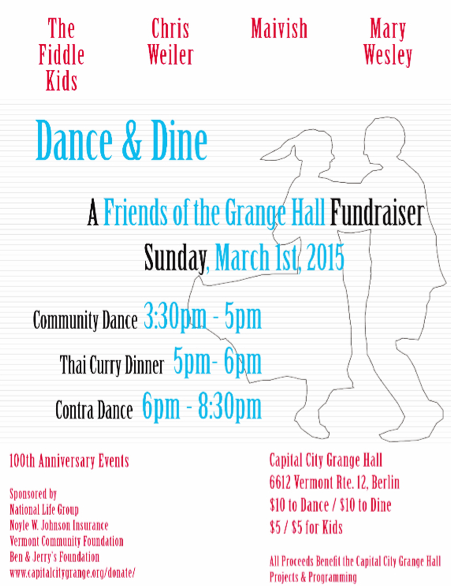 You are here: Home / Grange Notes / Community Fundraising That’s Fun For All! Community Fundraising That’s Fun For All! Join us for a good time, for a good cause–bathrooms! Dancing with friends and family in the afternoon (a great opportunity to share your love of the Grange and community dancing with people who don’t usually come), followed by a delicious Thai Curry dinner (freshly made spring rolls, tofu or chicken plus a mild coconut milk curry sauce and brown rice), followed by more dancing. What better way to support the next phase of renovations for the Grange Hall: brand new bathrooms on the lower level! Needed: volunteers to help prepare food for the dinner, starting in the early afternoon, and to serve it for the multitudes, and to clean up afterwards. Our stalwart chefs: Alison Forrest and Gail England will direct the operations. Call or email me to volunteer (swartztim15@gmail.com)! Mark your calendars for the 2nd dance in our finish-off-the-fundraising series, on Friday May 1st with Will Mentor calling, and Perpetual E-Motion playing their exciting brand of dance music! For Experienced Dancers: This means you know how to do a roll away, California twirl, pass through to a wave and the basic moves without being taught. You complete flourishes safely and on time without disturbing the flow of the dance. There will be a potluck dinner afterward, before the regular CDU dance for all comers at 8:00, with Will and Nor’Easter on stage again. Don’t forget that Will is coming back to call on May 1st, for another benefit dance! Many thanks for his support! 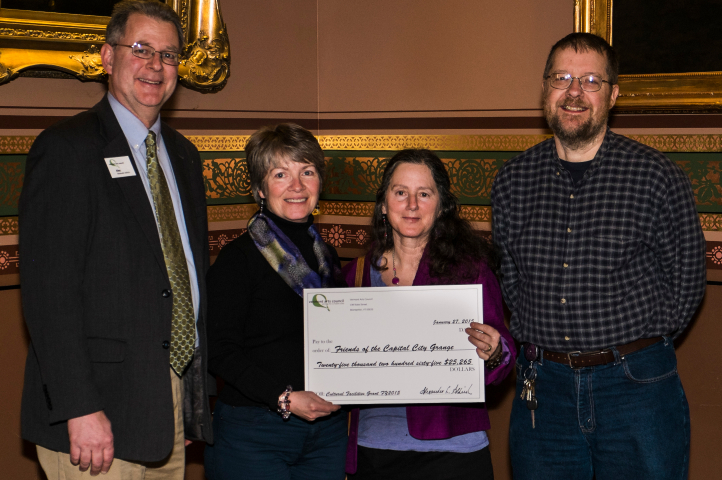 Friends of the Capital City Grange Hall receive $25,265 grant from the VT Arts Council! The picture above, taken by Peter Arthur Weyrauch for the Arts Council, shows Alex Aldrich of the Council on the left, just after handing over a symbolic (but impressively large) faux check to Patty Giavara and Carol Noyes (Chair and Treasurer of the FCCGH respectively), while I keep watch on the right. This event is really a pledge–we only get the actual cash once we match the needed amount with cash and in-kind donations, and complete the project successfully. We’ve still got a ways to go, but we appreciate the help we are getting. This grant (administered by the VT Arts Council in conjunction with the VT Historical Society and the VT Division for Historic Preservation) is a huge help for small, volunteer non-profits like the Grange and the Friends. The VT State Grange has agreed to give us a no-interest construction loan, since we need to pay the bills for the project until the Arts Council accepts our final report. And finally, we thank all the Grange community members who donate and volunteer to keep us going, and to fund and complete special projects like this, which benefit us all!